What Do Amish Children Have Less Of? AND WHY? | RANGEfire! 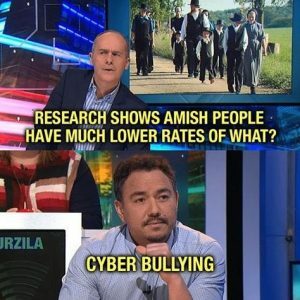 What Do Amish Children Have Less Of? AND WHY? According to this article from the Elko Daily Free Press, Asthma is the answer to the first Question, and Cows are the answer to the second. CHICAGO (AP) — Forget Fluffy and Fido. Bessie the cow just might make a healthier pet. The study was published in Thursday’s New England Journal of Medicine. It involved 60 school-aged children — 30 each from an Amish community in Middlebury, Indiana, and from a Hutterite colony near Mitchell, South Dakota. Amish and Hutterites both originated in Europe, share old-style Protestant beliefs and lifestyles and have similar genetic ancestry. No Amish children and six Hutterites had asthma. Other studies have found rates of about 5 percent in Amish school-aged children versus up to about 20 percent in Hutterites and 10 percent for U.S. kids. Reasons for the higher Hutterite rate aren’t known but exhaust from farm machinery is an unlikely explanation because they typically don’t come in close contact with it, said study co-author Carole Ober, a University of Chicago geneticist. Blood tests confirmed both groups of children had similar genetic profiles. But Amish children had far more white blood cells called neutrophils — important in fighting infections. Plus, these cells looked younger in Amish kids, suggesting their immune system was constantly stimulated by exposure to germs to produce more. She said the second “gee-whiz moment” came after researchers collected Amish and Hutterite house dust and tested it on special mice sensitized to develop asthma symptoms. Hutterite dust triggered breathing troubles and inflamed airways in the mice; Amish dust did not. “We could just say put a cow in everyone’s house and no one would have asthma anymore but of course that’s not easy,” Ober said with a chuckle. A journal editorial said the study bolsters evidence that exposure to germs from traditional farming may protect against asthma. The results also support the so-called “hygiene hypothesis,” which theorizes that relatively germ-free homes of modern society make infants more vulnerable to allergies and asthma. Dr. Talal Chatila, an allergy expert at Boston Children’s Hospital who wrote the editorial, said the study doesn’t answer when and how often exposure to farm dust might be needed to protect children and if it needs to begin before birth. Ober noted that research has shown that infants whose families have dogs are less likely to develop asthma and allergies but that acquiring a dog later on doesn’t make a difference.